The Milwaukee, Lake Shore and Western Railroad established the first rail line in Langlade County in 1881 when it laid 23 miles of track from Aniwa to Summit Lake. Francis Deleglise’s offers of free land persuaded rail officials to run the new line through his nascent city. The first train rolled into Antigo on August 15, 1881. The growth of Antigo and that of the Chicago and North Western Railroad (C&NW), which took over the MLS&W, were thoroughly intertwined. In 1907, the C&NW named Antigo headquarters of their Ashland division. During 1917, the peak year of railroad travel in northern Wisconsin, it is estimated that 77% of all freight and 98% of all passengers travelled by rail. Train travel continued to be of major importance well into the 1950s. During those decades, the C&NW had more miles of track than any other Wisconsin railroad. In 1913, the C&NW owned about 25,000 acres of land in Langlade County alone. The railroad played a prominent developmental role in the area, being involved in logging, hauling saw mill products to the main line, and by servicing manufacturers. Frequently, camp lines were built and operated by the lumber companies themselves. Once their usefulness was over, the rails were removed and used for a spur line to another camp or saw mill. Of growing importance after the turn of the century, was the railroad’s ability to transport large quantities of agricultural goods to market. During its peak years, the Antigo rail depot saw 10,000 rail cars of potatoes pass through during the harvest season. For several decades, railroad passenger service was secondary to the moving of timber. By World War I, however, passenger traffic reached significant numbers. People increased their rail travelling in order to visit seldom-seen relatives, or to enjoy a picnic outing, or even to shop in the big cities of Milwaukee and Chicago. In addition to the regular passenger trade, during summers from 1917 to 1950, the railroad operated “fish runs.” Special cars carried fishermen on trips to resorts in northern Wisconsin or Michigan’s Upper Peninsula. The 440 locomotive is a 2-8-0 Baldwin constructed in 1900 and is a close relative of the Chicago and Northwestern 175, the last steam engine to travel through Antigo in 1957. The Society, tried, but was unsuccessful in purchasing that locomotive. Union Pacific 440 was a compound locomotive that used steam twice. Steam was first admitted into smaller high-pressure cylinders. It was then exhausted into larger low-pressure cylinders. The benefit of increased fuel efficiency was offset by the several disadvantages and more practical methods of increasing efficiency were soon developed. No. 1660 was renumbered 440 in 1915 after modification. She was used on the Union Pacific's various lines in Kansas and Nebraska. 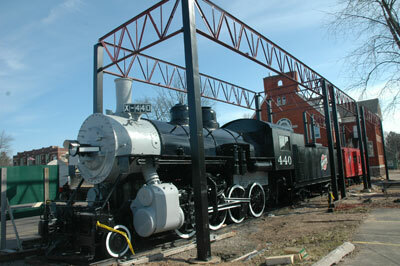 In 1955 the 440 was retired and donated to the Nebraska State Fair Association and displayed in Lincoln, Nebraska. When the fairgrounds were converted into a university coliseum, the 440 was saved by the Cornhusker Chapter of the National Railway Historical Society and donated to Mid-Continent Railway Museum in North Freedom, Wisconsin. She was moved on her own wheels and arrived at North Freedom in June of 1975. At Mid-Continent the locomotive was evaluated with an eye on restoration; to a working engine. In the mid-1980s, funding was raised to begin restoration, but by 1989, work was suspended due to lack of funding. 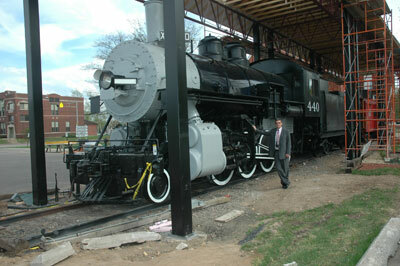 was project director for the 440 locomotive restoration. The Langlade County Historical Society then mounted a successful $75,000 fundraising campaign to purchase and restore the engine as a static, non-working display. She arrived in Antigo on Oct. 31, 2005, with her tender a few weeks later. Over the course of the next 18 months, she was lovingly repaired and restored by a largely volunteer cadre. A new 440 cab was constructed to replace the original, which was too badly damaged for restoration, and by late May, 2006, she once again resembled what she once must have been. 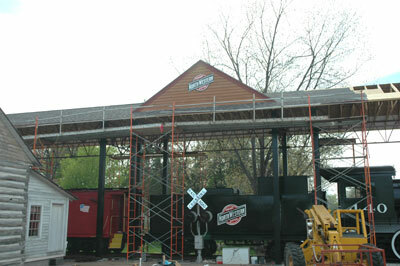 The spring of 2007 saw the construction of a roof for the locomotive and the museum’s caboose as well as final touches to the locomotive.